Taylor Sova entered 2017 NPC National Bodybuilding Championship in June. It is certainly no secret that competition takes extreme dedication followed by various sacrifices, but Taylor is determined to be a worthy contender in this competition. We’ve conducted an interview to gather a few thoughts from this strong-minded individual about her fitness journey and some friendly advice to others who desire to progress in NPC competition path as well. Taylor Sova is a 23-year-old occupational therapist residing in Chicago, IL. She started her NPC competition journey during her junior year of college. It started off slowly and she referred to herself as a “cardio bunny”. She was always on the treadmill with the occasional lifting but mainly focused on body weight accessory work. Similar to how many other females think, she was afraid to work out to the point of getting too “bulky” by lifting weights. Taylor then began to watch women on YouTube, observing their routines to encourage herself or give herself a new perspective on to improve her own workouts. The fitness videos of these females were so empowering; they all looked amazing, strong, and confident. This instantly sparked her interest, and they gave Taylor the push she needed to start lifting heavy weights. Gradually, she saw steady progress and after a solid year and a half of lifting heavy, she put on a healthy amount of muscle and decided to compete in NPC competitions. She has now been in NPC bodybuilding for three years and has competed twice and won her class in her first bikini show! Taylor has recently competed in her first national NPC competition; being able to compete in the NPC Nationals is a huge deal and shows just how strong her commitment is. Taylor is excited to compete in her EleiraFit NPC competition suit which she claims is the highest quality of material, price, and comfortability. Q: What are the first steps every bikini competitor should take? Q: What was most impressive to you about your first NPC competition? A: I was definitely impressed and happily surprised with how fun, encouraging, and sweet all the bikini competitors were backstage. My first bikini show was an enjoyable experience and a factor that played a huge part in that were the many people that I met; it’s so wonderful to meet others with a similar mindset and interests as you. I surely made some great friends there. Also, taking first in my class made the experience that much sweeter. Q: What are your fitness challenges right now and how are you planning to cope with them? A: My current fitness challenge, since I am now competing, is coming in fuller. I was a bit too lean for my last bikini show and the perfect bikini look is about a full, tight appearance on stage. So I’m currently working toward making sure that my muscles pop on stage. Once, I’m in my off season, I plan to gain a great amount of growth in both my shoulders and my glutes! Q: What is the best way to find a bodybuilding bikini coach you can trust? Is a coach absolutely necessary to become a successful bikini competitor? A: I coached myself through my first prep, but I must admit, it was very stressful! It is difficult to look at yourself objectively to make nutrition, training and posing tweaks because you are constantly focusing on your flaws. Getting a bodybuilding bikini coach is surely a vital step in reducing the stress out of prep. It is pretty easy to find a suitable coach via social media nowadays; however, I do advise that everyone should do extensive research on potential coaches to ensure that they are qualified. Speaking with their previous clients about their experience or training routines would be a good way to get an idea of if they would be a coach that fits your needs. Once you find a bodybuilding bikini coach, make sure they are timely with their responses and answer ALL of your questions. Also, make sure that their plans are comprehensive and meet your fitness needs. You are allowing them to take charge of your body, so it is essential that you fully trust them. 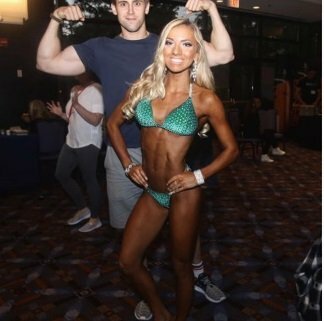 Q: What tanning and makeup advice, or products can you recommend to other NPC competitors? A: With tanning, I recommend to always go with the show spray tanner for your first NPC competition. It may be costly but it takes the stress away from any cosmetic error; this would also ensure that your tan will match everyone else’s on stage. You never want to be too dark or too light on stage, so the show spray tanner gives you reassurance and a peace of mind. When it comes to makeup, there ar e great YouTube tutorials to assist people in stage makeup application, if you feel comfortable doing your own makeup; this goes for doing your hair as well. For those who are not as confident, I suggest to go with a makeup artist; the NPC competition usually has someone who does hair and makeup at the venue, so just inquire! As for suits, I’d definitely recommend all to go with EleiraFit bikinis for NPC competitions. They do custom adjustments for all of their bikinis which are perfect for getting the exact fit you’re looking for; they never disappoint me! Q: What makes you constantly stay motivated? A: What keeps me motivated is knowing that bodybuilding competition is my passion and continuing to grow throughout this journey is the most rewarding feeling for me. If you don’t have passion in your heart for bodybuilding competition, you won’t last long in this sport. This is a very competitive and mentally tiring sport that you must stay committed to every single day, hour and minute during prep. Of course, I have days where I am a bit tired out, but reminding myself why I started in the first place and why I love what I do always lights my fire once again. The goals Taylor sets for herself are high, and she constantly challenges herself to push her limits in order to be a worthy bikini competitor—her high spirits and inspirations are what keep her driven. Of course, winning the 2017 NPC Nationals would be the ideal end goal, but Taylor believes that simply being able to compete and be a part of this experience is already a thrilling accomplishment and achievement in her life. We are excited to follow Taylor throughout her fitness journey and wish that she continues to pursue her passion in hopes that it will inspire others to do as well! 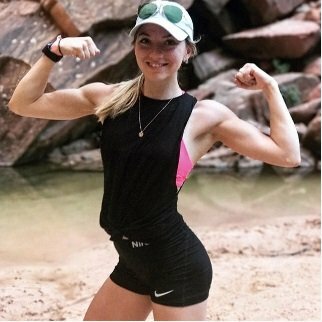 If you’d like to further follow Taylor Sova on her amazing fitness adventure, follow her on her Instagram, @taysova6, YouTube channel or contact her via email at taysova6@gmail.com. What to read more stories from bikini competitors ? Sign-up for our newsletter!